Most current theories of lexical access in speech production are designed to capture the behaviour of young adults – typically college students. However, young adults represent a minority of the world’s speakers. For theories of speech production, the question arises of how the young adults’ speech develops out of the quite different speech observed in children and adolescents and how the speech of young adults evolves into the speech observed in older persons. Though a model of adult speech production need not include a detailed account language development, it should be compatible with current knowledge about the development of language across the lifespan. In this sense, theories of young adults’ speech production may be constrained by theories and findings concerning the development of language with age. Conversely, any model of language acquisition or language change in older adults should, of course, be compatible with existing theories of the "ideal" speech found in young speakers. For this Special Issue we elicited papers on the development of speech production in childhood, adult speech production, and changes in speech production in older adults. The structure of the Special Issue is roughly chronological, focusing in turn on the language production of children (papers by Behrens; Goffman, Heisler & Chakraborty; Vousden & Maylor), young adults (papers by Roelofs; Schiller, Jansma, Peters & Levelt; Finocchiaro & Caramazza; Hartsuiker & Barkhuysen; Bonin, Malardier, Meot & Fayol) and older adults (papers by Mortensen, Meyer & Humphreys; Spieler & Griffin; Altmann & Kemper). We hope that the work compiled here will encourage researchers in any of these areas to consider the theories and findings in the neighbouring fields. 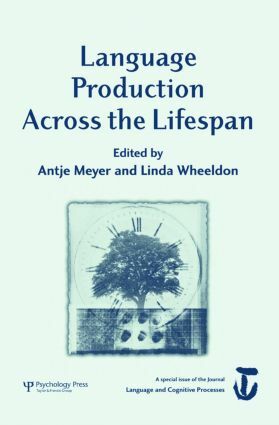 A. Meyer, L. Wheeldon, Word and Sentence Production Across the Lifespan. H. Behrens, Input-Output Relationship in First Language Acquisition. L. Goffman, L. Heisler, R. Chakraborty, Mapping of Prosodic Structure onto Words and Phrases in Children's and Adult's Speech Production. J.I. Vousden, E.A. Maylor, Speech Errors Across the Lifespan. A. Roelofs, Functional Architecture of Naming Dice, Digits and Number Words. N.O. Schiller, B.M. Jansma, J. Peters, W.J.M. Levelt, Monitoring Metrical Stress in Polysyllabic Words. C. Finocchiaro, A. Caramazza, The Production of Pronominal Clitics: Implications for Theories of Lexical Access. R.J. Hartsuiker, Language Production and Working Memory: the Case of Subject-verb Agreement. P. Bonin, N. Malardier, A. Méot, M. Fayol, The Scope of Advance Planning in Written Picture Naming. L. Mortensen, A.S. Meyer, G.W. Humphreys, Age-related Effects on Speech Production: A Review. D. Spieler, Z. Griffin, The Influence of Age on the Time Course of Word Preparation in Multiword Utterances. L.J.P. Altmann, S. Kemper, Effects of Age, Animacy and Activation Order on Sentence Production.